Cupcake™ Original Vodka, one of four new super-premium, six-times distilled vodkas, won Best Vodka of Show honors out of 28 vodkas worldwide at the prestigious 2011 New York World Wine & Spirits Competition. The Best in Show award is reserved for those spirits that receive a gold or double gold distinction and then are chosen as the best during another blind tasting by the panel of judges. Cupcake Devil’s Food Vodka also received a gold medal at the competition. 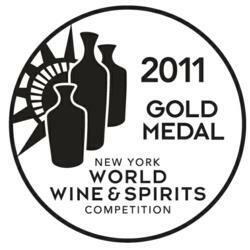 Judged by a group of recognized spirits experts, including Anthony Dias Blue, CEO of Blue Lifestyle and executive director of the competition, the New York World Wine & Spirits competition, held on June 27, 2011 in New York City , attracted over 100 spirit brands from around the world. Cupcake super premium Vodkas include Original (unflavored), Chiffon (Lemon), Devil’s Food (Chocolate) and Frosting (Vanilla). Each of the Cupcake vodkas carries a suggested retail price of $17.99 per 750ml bottle. Additional information is available at http://www.cupcakevodka.com and http://www.facebook.com/CupcakeVodka. Underdog Wine & Spirits, an unleashed unit of The Wine Group, is the champion of emerging brands for the new millennium: the “underdogs” of the sometimes stuffy wine and spirits world. We work with domestic and international producers to craft unique adult beverages that are a breed apart. The home of Cupcake, Fish Eye, flipflop, Big House and Octavin, our portfolio includes many of today’s most dynamic growth brands. For more information about Underdog Wine & Spirits visit http://www.udws.com.